Acetylene is used as an intermediate in chemical manufacture and as an industrial gas in the metalworking industry, primarily for cutting and welding. Since compression and transportation of acetylene is not practical for large-scale chemical use because of its flammability and explosiveness, almost all acetylene for chemical synthesis is consumed at or near the production site. Chemical uses account for about 88% and industrial uses for 12% of consumption. Vinyl chloride monomer (VCM) is the largest chemical use for acetylene, representing nearly 85% of the total acetylene chemical consumption. Vinyl acetate monomer (VAM) is the second-largest chemical use, accounting for about 7%. Production of acetylenic chemicals (1,4-butanediol [BDO], etc.) is the third-largest chemical use, with a global share of about 5%, but it represents the largest market in the United States and Western Europe. Other chemical uses include the production of polychloroprene rubber and acetylene carbon black. Use as an industrial gas in the metalworking industry primarily for cutting and welding is also an important end use for acetylene. 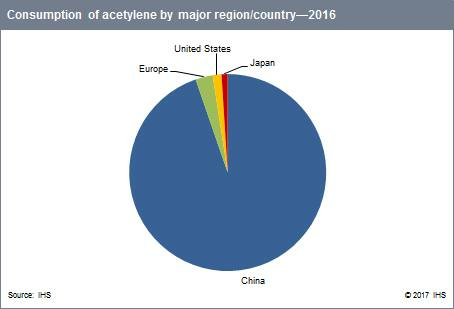 China is the dominant player in the acetylene market, accounting for nearly 95% of the total acetylene production and consumption in the four major regions in 2016, with Europe, the United States, and Japan accounting for the remainder. China's abundant coal reserves have led to the development of large-scale production of chemicals from coal via acetylene. Because of the dominance of China in the global acetylene market, consumption and growth in recent years have been driven by China. With the rapid development of VCM, VAM, and BDO production from acetylene in the past five years, Chinese consumption of acetylene increased at an average annual rate of 5–6% between 2011 and 2016 and is expected to continue to grow at nearly 5% per year between 2016 and 2021. Acetylene consumption in Europe is forecast to grow at only around 1% annually. Western Europe accounts for more than half of the total European market, followed by Eastern Europe and Central Europe. The acetylene market in the United States is small and mature, and is expected to increase at a rate of less than 2% annually during the next five years. Japan is a small producer and consumer of acetylene. Japanese consumption is mainly for the production of polychloroprene rubber. Overall consumption will decrease slightly during the forecast period.